The Picasso Museum in Barcelona shows today in the exhibition of Picasso’s passion “grequiana” fascination and influence that Domenicos Theotocopoulos in the Malaga painter in different stages of their lives. 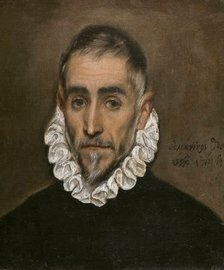 The result of an exchange of work, the Picasso Museum exhibit until next January 17th Caballero Anciano, a masterpiece of El Greco portrait, which belongs to the collection of the Prado Museum. This work is exhibited along with 29 pieces that are part of the permanent collection of the Barcelona museum, all selected by the exhibition curator and curator of the center, Malén Gual. As explained Malén Gual, “This admiration was evident especially in the period of contact between Picasso and Barcelona Modernism, in the Blue Period, at the beginning of Cubism and in the sixties, when he glanced toward the century Spanish gold. The painting “caballero anciano” is an oil painting of 1587-1600 and one of the most literary and artistic interest has raised since the beginning of his exhibition at the Museo del Prado. The painting by El Greco responds to a rare type, the short bust and austere at the same time, where the faces portrayed in a very direct way to the scrutiny of the viewer, and where are minimized rhetorical elements that accompany and contextualize the portrait in the Modern Age: clothing, stage and gestures. Picasso’s admiration for El Greco began in his youth, he tells the commissioner, when he had the opportunity to study the work of El Greco following his visits to the Prado Museum in Madrid, during the period 1897-1898, while studying in the Real Academia de Bellas Artes de San Fernando. The young Picasso soon decided to train on their own, learning precisely observing the masterpieces preserved in the Prado, “although in the records of the Madrid gallery has no record of that copied a painting by El Greco, and yes, instead, works of Velázquez and Murillo, “says Gual. From this period also comes the fascination with the work of Velázquez, observed on a sheet of drawings in Horta de Sant Joan in 1898 in which he writes a declaration of intentions. “Greco Velázquez inspire me”, exposed by the portrait “Man the style of El Greco “(1899). In the exhibition you can see a series of drawings of characters with stylized heads, “the grequiano way,” often mixed with other drawings and caricatures of Picasso belonging to this period. Returning to Barcelona, ​​in the circle of modernist café Els Quatre Gats, he became acquainted with Santiago Rusiñol, Miquel Utrillo and Ignacio Zuloaga, fans, collectors and supporters of El Greco at a time when he had not yet received widespread recognition and even his work was still attached to the Italian school.